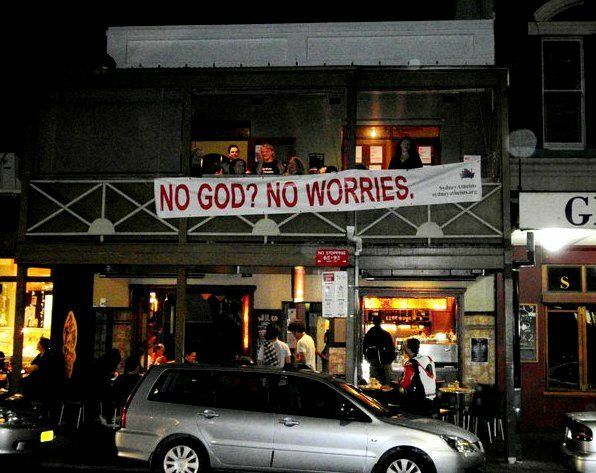 Last Saturday we launched the Sydney Atheists Bus campaign officially at Cafe Well Connected, in Glebe. It was not just a nice evening among free-thinker, but also raised more than $800. Thanks to everybody, especially to Murray for digging deep to get the two best seats on the bus. The raised fund will comfortably cover the banners that will be attached to the bus; you see one of them here hanging prominently on Glebe Point Road. If you want to contribute to also cover the bus hire, feel free to donate.